For Bi-Passing doors up to 100 lbs. System has four free-rolling nylon wheels mounted on pivoting rocker-arms which allow constant contact with track. Each door therefore, rides on eight wheels. Skipping or jumping is impossible. The ball-and-socket suspension compensates for minor header misalignment. 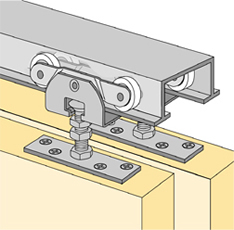 Hangers are secured by vibration proof stop nuts. Description: Double aluminum track - 6 ft. Description: Double aluminum track - 8 ft.